WEST WINDSOR – With a message of “a new vision for student success,” Dr. Jianping Wang was formally installed as the sixth president of Mercer County Community College (MCCC) at the college’s Kelsey Theatre in a ceremony attended by local officials and MCCC faculty and staff. Wang (pronounced WONG), assumed her duties at MCCC on July 1 following a nationwide search that attracted more than 60 applicants. She succeeded Dr. Patricia C. Donohue, who retired last year following a 49-year career – the last eight at Mercer. In his introductory remarks Mark Matzen, chair of the MCCC Board of Trustees, noted the extensive selection process that resulted in a visionary leader for Mercer. “Dr. Wang has demonstrated her commitment to making a difference in the lives of students, and leading a college that remains engaged with the community and holds student success as its hallmark of excellence,” Matzen said. In her inaugural address Wang outlined her philosophy on education, rooted in her experience growing up in Communist China – where education was a privilege bestowed only on a select few. Individual success, she said, comes from many sources and involves the efforts of many individuals. Dr. Jianping Wang was inaugurated as the sixth president of Mercer County Community College in a ceremony on April 15, 2016. Her journey involved challenging the policies of the Maoist government, gaining admission to one of China’s premier universities, and eventually immigrating to the United States, where she pursued her education and achieved her dream of becoming an educator. 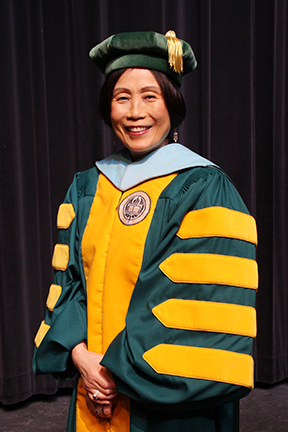 Wang served as the Vice President of Academic Affairs at Ocean County College (OCC) in Toms River prior to her appointment at Mercer. She earned a Bachelor of Arts degree in English from China’s Hangzhou University, and a Master of Arts degree in English Literature from Beijing University. Wang received her master’s degree from the Harvard Graduate School of Education in 1993, and her Ed.D. in Educational Leadership from Fielding Graduate University in Santa Barbara in 2007. She served as Director of Institutional Research and Effectiveness at Roxbury Community College in Boston from 1995-1998; Dean of the Division of Arts and Humanities at SUNY Westchester Community College in Valhalla, N.Y. from 1998-2012; and at OCC since 2012.